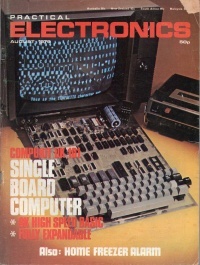 Ah, I remember vividly that August 1979 edition of Practical Electronics. I was 11 years old, and from the moment I laid eyes on that cover, I just knew that I was going to build one. Several months and much pocket money later, I had my Compukit. What an amazing machine - 4k of memory was more than enough for my first simple BASIC programs. I soon learnt 6502 machine code. Years passed, and I moved on to other machines (most of the Atari 8-bit and 16-bit line, followed by IBM clones and Macintoshes). Somewhere along the line, my Compukit and I parted company. Without a Compukit, I decided to do the next best thing - I built an emulator in software! I hope you enjoy the various Compukit information that I've gathered here. If you have anything to contribute please email me. This page was last modified on 13 January 2014, at 19:17. This page has been accessed 235,915 times.